Ocean Reef Towers is a boutique condominium building located in the heart of the prestigious Boca Raton beachfront. This 14-story building is home to just 55 luxurious units which offer one to three bedrooms and range from 1,175 to 2,200 square feet of living space. Ocean Reef Towers was built in 1970 but has been completely remodeled throughout. Residences have spacious floor plans, floor to ceiling windows with ocean views, state of the art kitchens with custom cabinetry, marble flooring, walk-in closets, washers and dryers inside, and master baths with luxurious spa tubs. Units also have multiple oversized balconies and terraces that offer expansive views of the Atlantic Ocean. Amenities at Ocean Reef Towers include direct beach access, an oceanside swimming pool, steam spa and sauna, oceanfront fitness center, garage parking, community lounge area, game room, a newly remodeled lobby, extra storage, bike and jog paths, and 24-hour security. Ocean Reef Towers is a tropically landscaped beachfront property located on A1A north of Palmetto Park Road and is surrounded by similar luxury condo buildings such as Aegean and Brighton. 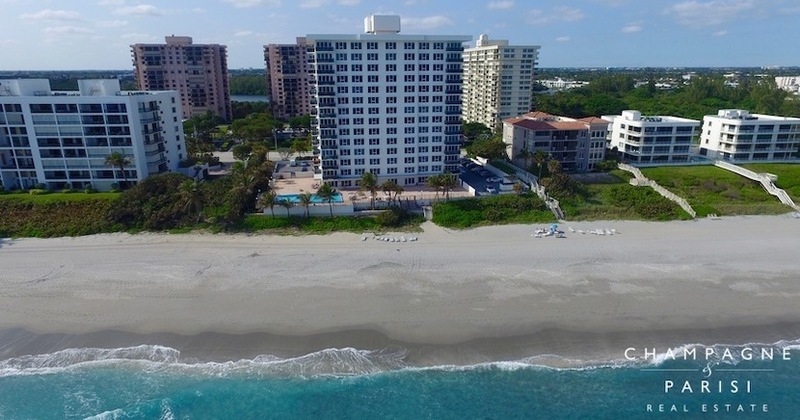 Residents can step onto the beach or take a short drive to downtown Boca Raton. Included below are condos for sale in Ocean Reef Towers, a development in Boca Raton, FL. These real estate listings are updated daily from the MLS with large photos, maps, local school info and detailed property info. Do you want more information about any of the condos in Ocean Reef Towers? Just click the "Request More Info" or "Schedule a Showing" button when viewing the details of that listing. As Boca Raton real estate experts, we not only have access to the property disclosures and past sales history of each property but the knowledge & experience to help you interpret them. We can also provide you with the dates and prices of nearby condos that have recently sold in Boca Raton or any of the local developments. Contact a Champagne & Parisi Agent to learn more about purchasing a residence in Ocean Reef Towers and start your oceanfront living today! Also, please consider registering for a free account which will enable you to receive automatic email notifications when new condos in Ocean Reef Towers Boca Raton come on the market.